Above and below: Illustrations from a chapter on ‘Managing Mobility in African Rangelands,’ in a book, Resources, Rights and Cooperation: A Sourcebook on Property Rights and Collective Action for Sustainable Development, published in 2010 by the International Food Policy Research Institute for the CGIAR Systemwide Program on Collective Action and Property Rights (CAPRi); ILRI scientist Nancy Johnson was one of four members of the production team for this book (illustration credit: IFPRI). In a commentary in Today Online, the American economist Jeffrey Sachs, director of the Earth Institute at Columbia University and special adviser to United Nations Secretary-General on the Millennium Development Goals, argues for policies that support rather than hamper the movements of livestock herders in the drought- and hunger-stricken Horn of Africa. Nancy Johnson, a scientist with the International Livestock Research Institute (ILRI), Maryam Niamir-Fuller and other authors explore the merits of pastoral mobility in a chapter of a book, Resources, Rights and Cooperation, which is a sourcebook on property rights and collective action for sustainable development. The source for their material is a CAPRi research brief published in 2005 by Maryam Niamir-Fuller (see below). ‘In arid and semi-arid lands in Africa, pastoralists manage uncertainty and risk and access a range of markets through livestock mobility. Mobility enables opportunistic use of resources and helps minimize the effects of droughts. . . .
‘Undergrazing of remote pastures or in protected areas can lead to the invasion of unpalatable plants, lower vegetation cover, and lower diversity of plants, and can sometimes be a more serious problem than overgrazing. . . .
‘The scale and magnitude of persistent environmental decline in dryland Africa—and how livestock grazing has affected such changes—appear to have been overestimated. . . .
‘Mobile pastoral systems also appear to be more economically efficient than their sedentary counterparts or commercial ranching. . . .
Government policies have upset the economic balance between crops and livestock by favoring crops and agricultural encroachment onto rangelands. Governments have discouraged investments in the range and livestock sector and claimed “vacant” pastoral land for national parks and government-owned farms. 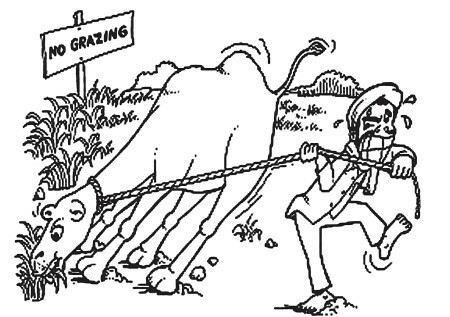 ‘Projects in Africa have long sought to develop livestock productivity rather than enhance livelihoods. Drawing on the classical ranching model from the United States, interventions encouraged sedentarization, destocking, and water development. However, they did not increase livestock productivity, and some were very destructive. . . . In the 1990s . . . mobility was still seen as a problem to be eliminated, not a trump card to be strengthened. ‘Livestock needs to be seen as an integral part of conservation and development in Africa, since transhumance may even be a necessary precondition to sustainable development in arid lands. 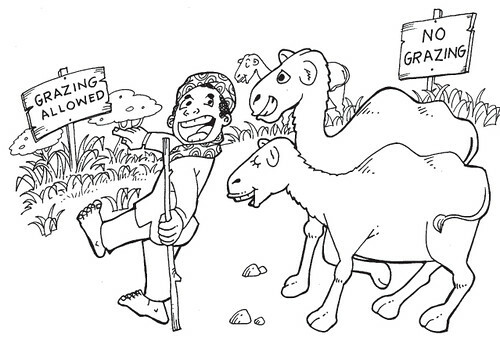 • Mobile pastoralism is not a “backward” means of livelihood—laws, policies and procedures should be considered backward, since they do not recognize the ecological and economic value of mobile pastoralism. • A clearer understanding of common property regimes and a holistic analytical framework for pastoral development activities are also required . . . .
• The fundamental design principles related to managing institutions for mobility are nested property rights, fluid boundaries, inclusivity, flexibility, reciprocity, negotiation, and priority of use. . . .
• Resource holders need to retain authority to grant temporary use rights to secondary and tertiary users. . . .
• There has been strong momentum toward “co-management,” or systems of common property regimes that combine government decentralization with community participation. Though the approach is far better suited than any other to mobile pastoralism, it needs to deal with large-scale management of contiguous land. Read the CAPRi policy brief on which this chapter is based: Niamir-Fuller, M. 2005. Managing Mobility in African Rangelands. In: Mwangi, E. (ed). Collective Action and Property Rights for Sustainable Rangeland Management. CAPRi Research Brief, International Food Policy Research Institute, Washington, D.C.
Read the whole CAPRi sourcebook: Resources, Rights and Cooperation: A Sourcebook on Property Rights and Collective Action for Sustainable Development, International Food Policy Research Institute for the CGIAR Systemwide Program on Collective Action and Property Rights (CAPRi), 2010. Read the whole news commentary by Jeffrey Sachs in Today Online: Famine and hope in the Horn of Africa, 2 Aug 2011.